If you want to improve your law practice, your business, your customer service posture, then you need to ask two simple questions, and ask them regularly: What are we doing well and what can we improve? I believe in reducing complex ideas into bite size morsels that can be more easily consumed. When I deliver workshops to law firm partners on Legal Project Management, purists in the audience will sometimes quibble with my casual use of Lean Six Sigma terminology. Others will want to deconstruct some of the financial calculations I use when demonstrating the inherent profit potential of Alternative Fee Arrangements. But in doing so they miss the forest for the trees. It's fine to debate the details once you've mastered the larger concepts. The same philosophy applies when it comes to using client feedback to improve your business. I recently engaged in a vigorous discussion with a consultant whose academic credentials in statistics and market research far exceed my own. She produces exhaustive reports on brand familiarity, relative market position and statistically precise indexes of client satisfaction. 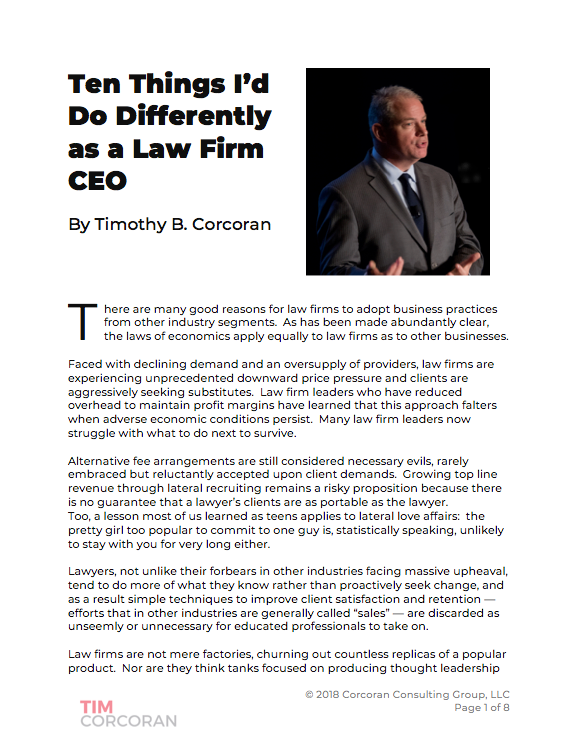 But, she laments, her clients -- which like my practice include both law firms and service providers catering to law firms -- generally ignore her studies, filing them away in the proverbial circular file rather than formulating an action plan. My diagnosis was simple, and it reflects my own approach to assessing client satisfaction and continuous improvement: reduce the complexity and focus on gathering actionable information. There's a time and a place for complexity and nuance, but it always follows acceptance of core concepts. If you don't know explicitly what your clients value about your service and if you don't know explicitly what they wish you would do better, then all the charts and graphs and analysis are just so much statistical noise. Here's an example of my annoying habit of reducing complex concepts into simple ideas: sustainable profitability comes from client satisfaction; client satisfaction comes from continuous improvement; continuous improvement happens when we regularly ask our clients what we do well and what we can improve. It's that simple. When I present these questions, there is always someone who will suggest alternative wording, or suggest two or three additional questions to add color or depth to the findings. Sometimes this works. More often than not, it just complicates things. It sometimes seems as if we create complexity where simplicity is needed, because complexity pays better, or provides job security. But there is no better job security than channeling the voice of the customer, and this isn't hard to do. What are we doing well? Let's not assume that everything -- heck, anything -- we're doing is worth continuing. It's critical to know explicitly and specifically what clients value, why they value it, and that they want us to continue doing it. Here are actual excerpts from client feedback sessions I've conducted, or feedback my clients have compiled. The consistent theme of each is that no one knew the high value the clients placed on the specific action or service, and in some cases we had been debating whether to stop the practice. It may come as a surprise to learn that many clients, possibly most clients, don't relish the thought of giving criticism any more than those on the receiving end like hearing it. The questions as posed above help avoid the emotional baggage and put the focus where it belongs. Let's discuss those things we do right and that you believe we should continue, and let's discuss those things that from your perspective we can do better. Once you master this approach, there's a lot more to help you hone in on specific industries or market segments or to help synthesize and prioritize a high volume of disparate feedback. But let's not get ahead of ourselves. Start simply and grow from there.